WordPress’ default login URL is /wp-login.php (or you can just type in /wp-admin/ and it’ll redirect you there if not yet logged in). For example: http://www.example.com/wp-login.php. I can tell you’re using WordPress. It’s pretty easy for a hacker to tell if any given website is a WordPress website. You can look at the page’s source and see things like /wp-content/themes/style.css or /wp-content/plugins/…, etc. Once I know your site is a WP site, I now know your login URL is /wp-login.php. So now I know your login URL. I also know that WordPress creates an “admin” username by default. Now Mr. or Ms. Hacker has your login URL and possibly your login username. Now it’s a matter of guessing your password. Did any of that sound like fun? I bet not, but it’s important stuff. At the very least, I hope I’ve scared you into reading the rest of this how-to post because the solution is quick, easy, and painless, and anyone who can install and activate a plugin can do it. 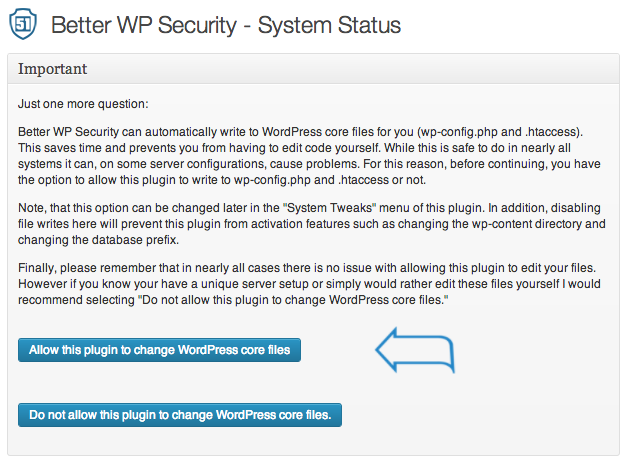 The short answer is to install, activate, and configure the Better WP Security WordPress plugin. Compatibility might be an issue. Make sure to read and understand all the Better WP Security options before changing any settings. Talk to your web host or developer before continuing if you know you have an unusual setup but aren’t sure how it may be affected by this plugin. I tested with WP Engine and didn’t have any issues. Follow the plugin author’s recommendation and read the Better WP Security Installation Tips and FAQs. If you already have the site added to ManageWP Dashboard, you’ll need to update your ManageWP options, but it’s quick and easy. Also, please read the ManageWP “Known Issues”, which mentions one of features of the Better WP Security plugin. 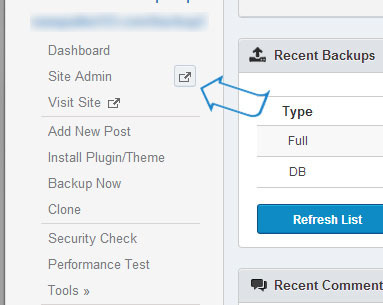 Continue reading for all the step-by-step instructions for Better WP Security and updating the ManageWP Dashboard options. Duh. Do it with ManageWP. Take a full backup, not just a database backup. Like all backups, verify it’s completed and in your desired location before proceeding to the next step. I’ve looked long and hard for a “hide login” plugin and there weren’t many quality choices. And the aptly named Hide Login plugin did not work for me (thank God I was on a WP Engine staging site because I got totally locked out). And there used to be a plugin called Stealth Login which no longer exists. At the recommendation of several WordPress gurus, I tried Better WP Security for this purpose alone (although it has a bunch of great features), and it worked like a charm right from the start. Open the plugin’s wp-admin options page. Allow the plugin to change WordPress core files (read the warning first). Click the “Secure My Site From Basic Attacks” button. Check the “Enable Hide Backend” box. Enter your desired login, register, and admin slugs or leave them at the plugin’s defaults of “login”, “register”, and “admin”. Don’t forget your new URLs, especially the login URL! You might want to write them down somewhere until you get used to them. Or never need to remember the login URL if you use an auto-login tool like ManageWP (additional steps follow). Setup step 2. Read the instructions and, in general, click to allow changing WordPress core files. Setup step 3. In general, click the option to allow the plugin to activate its default security settings, since this plugin does more than just change the login URL. After saving once, you’ll be able to uncheck the box if you want to turn the feature off, or you can leave it checked and just change the login URLs anytime you want. Login to your ManageWP Dashboard. In the left navigation menu, click on the site you changed the login URL for. 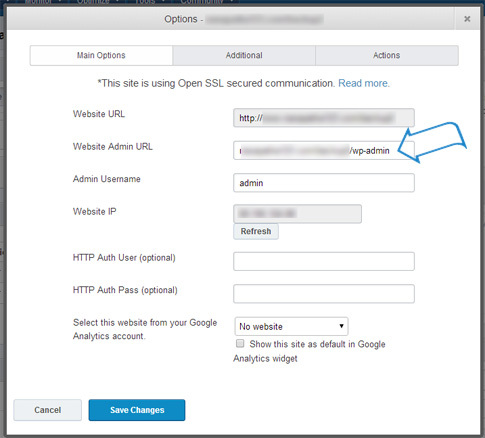 Change the “Website Admin URL” option from …/wp-admin/ to …/login/ (or whatever you changed it to). Click “Save Changes” and the window will auto-close after a green “Options Updated” message is displayed for a second or two. Click on the site again and click the “Site Admin” (or the icon next to it to open it in a new window) to make sure ManageWP can auto-login for you at the new URL. If you were able to login via ManageWP Dashboard, you’re all done. 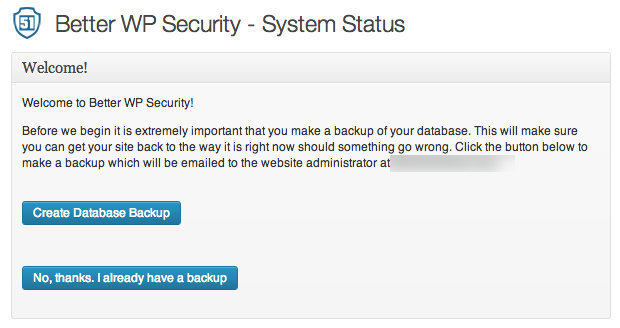 Go to your ManageWP Dashboard, click on the site URL and click “Options”. At the site’s ManageWP Options pop-up, you’ll see your current login URL. 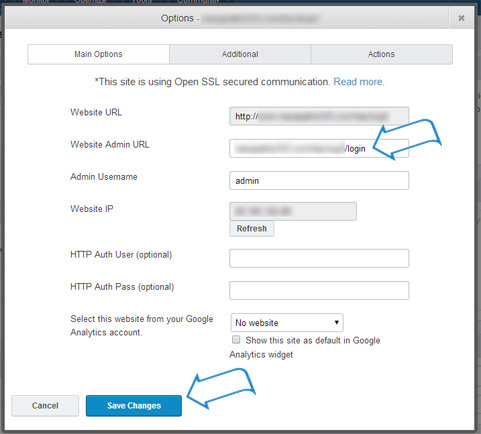 Change the login URL to your new login URL and click “Save Changes”. Make sure the ManageWP Dashboard can still auto-login for you. Click on the site URL you just updated the options for and click Site Admin link to see if it works. For some, you might not care how it works; for others, you may want to know all the details. Let’s just say it’s the magic of the .htaccess file. Without getting too technical, the plugin adds about 30 lines to the top of your main WordPress .htaccess file. That’s really all the magic that’s needed to change the login URLs. Note: Neither the wp-login.php file nor the wp-config.php file is modified, moved, or renamed. If you’re a developer looking to learn all the ins and outs of .htaccess files and rules, consider purchasing the .htaccess made easy eBook. To be clear, no knowledge of .htaccess is needed to use the Better WP Security plugin. 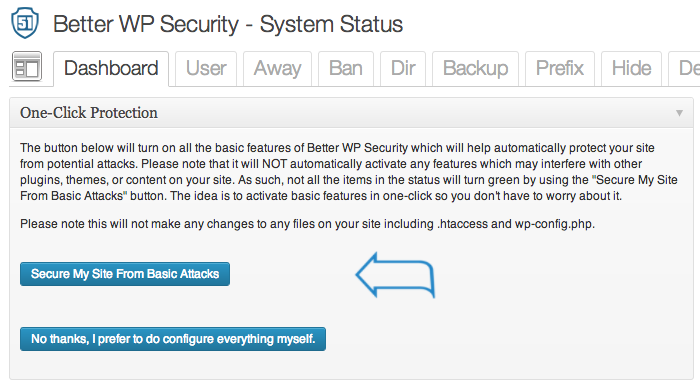 There are many more benefits of using the Better WP Security plugin, and it even works on single sites and Multisite. Read more about its features at its WordPress plugin page and give it a good rating if it worked well for you. 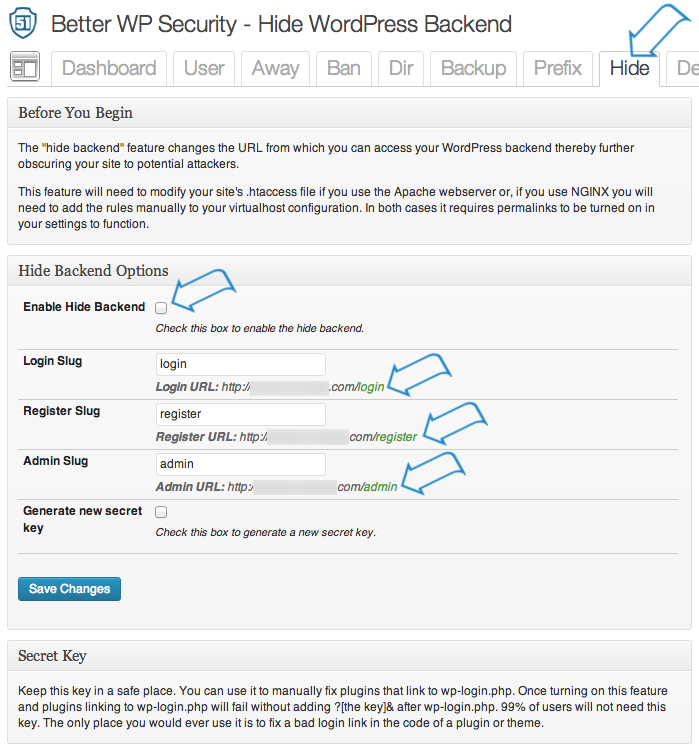 Change your WordPress login URL today. Feel free to post a comment below once you’ve done it or if you run into any problems. Next blogpost:The WP App Store: a Step in the Right Direction for WordPress Users? Thanks for the tutorial, Clifford. I will have to change my login URL. I am receiving too many login attempts from bots. It’s my Jetpack plugin blocking all these so far. This article had run out of time. But WHERE in the current interface of ManageWP one change the login url? Changing the login URL is essentially hacking the core, and could pose problems with other plugins. That’s why ManageWP does not have this option. Hi used this plug-in on my site to change the wp-admin url, now nun of my logins work…please help. i have try it in my wp site. send me email if you have another like this. Thanks for sharing such important information. It will help me and my clients as well. This seems what I am looking for. I’m already using Ninjafirewall. Is this plugin compatible or will they bite each other? Thank you Clifford Paulick. I am following your posts for some time and every time i get great tips. i already change my admin url but how to change now using my database? Thanks Clifford, it’s really so simple and helpful. This very complete and straightforward to become practiced in the least, but I‘d like to question, if there will be free tools available which will tell us wordpress login URL? I fear that in case for instance there will be such tools, hackers can easily certainly determines the login URL. to all guys who post their website here. Much better you don’t do this because so everyone knows you website now and that you use such kind of plugin. I locked myself out of my site and started to freak out a bit. I deleted the plugin folder in my control panel through my host and was still locked out. Then I remembered that the plugin asked to modify the htaccess file and so I went in there and found the code it added and removed it. All better again. Maybe I should read this entire article before I mess around with it again. ps. I whitelisted my ip but it just kept saying that the page was not found. I was looking for something to simply change my register and wp-admin links and fell on your article. It’s a very interesting article and enjoyed reading it. I think the plugin is ineterting as well, however the steps that you explain to take after installing fail to mention that the plugin needs the pro version which is a minimum of $80/year and up. So I was a little disspointed to find this out only at the end of reading and installing the plugin simply to change 3 links. So I simply uninstalled it. Would just be nice to mention that beforehand. Otherwise, as I stated above, great article on security. Recently, I`ve been looking in to adding additional layers of security to my wife`s website (it got pharma hacked) & one of the plugins I looked into was Stealth Login, which is apparently still in business, periodically updated (it was last updated 12 months ago & currently is listed as compatible with WP ver. 3.4.5 or higher), & being used on WP ver. 4.4.10 with no complaints about incompatibility so far. You can go look at “https://wordpress.org/plugins/stealth-login-page/”. 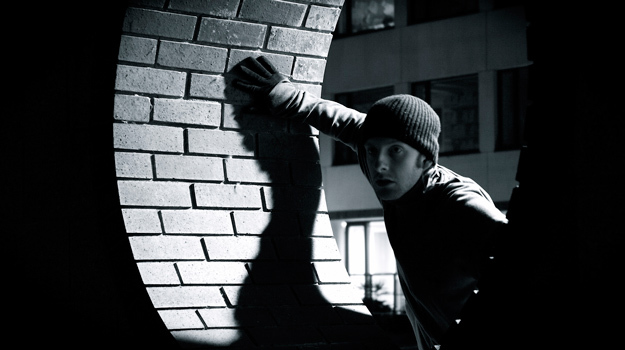 This article was indeed very useful as nobody wants to get there WordPress hacked! I have changed my URL , thanks for letting us know about this wonderful plugin. Great article but now is call ithemes security and in free version only one login access can change. Hey clifford, is there any method to change the whole wp login page code with our custom made code? because someone told me that every wp developers knows the complete structure of wordpress so its very easy to them to hack any wp website. what do u think about this scenario? thankyou for tutorial, I never think about it before…. before I use wp-admin and now I was succes change it… nice information,, I like this post 🙂 Im from indonesia, sorry about spelling..
nice one! i would try this to my personel website.. is the plugin free? Thanks. I wonder if this will cause issues for further updates? i.e. WP core and plugins? Hi Michael. It shouldn’t. However, this post was written prior to iThemes acquiring the plugin, rebranding it, and making significant changes. However, I’d guess this functionality remains and wouldn’t cause issues for future updates. It’s been a couple years since I looked at it, but I believe it’s accomplished via HTACCESS… but don’t quote me on that. its helping to me to secure my site. thank you thank you thank you both for manageWP plugin AND for this super helpful solution to redirecting my login to a custom url!!! This plugin I was looking for, thank you for writing a very helpful awakening my wordpress blog securely. i think this tutorial is amazing. I’ve been looking for a way change the name of the admin and this time I found. I’am wordpress user. I will try on my website. Thank you so much. Thanks for making clear how itheme security (former better wp security) changes the log-in URL. You just save my day. Can you please tell me, will it work on Arvixe VPS? Really amazing post. Hi Imtiaz. I don’t know of any reason why it would not. However, this plugin has gone through significant changes since this post. Thanks for letting us know. Glad to hear! I’m sure it’s even better now that iThemes took it over. hope it works as it mentioned…thumbs up buddy. I use this plugin on my WP multisite installation. However when I hide the back end, that bit works fine and relocates the login page to the slug I have chosen. Its after that is the problem… I enter my user / pwd and then rather than get to the wp-admin backend instead I just get a 404 page not found error? As this post was written over a year ago and has since become iThemes Security plugin ( http://ithemes.com/2014/03/17/better-wp-security-plugin-changing-ithemes-security-need-know/ ), I’d say the best solution is to contact official support. Hope you get it worked out. 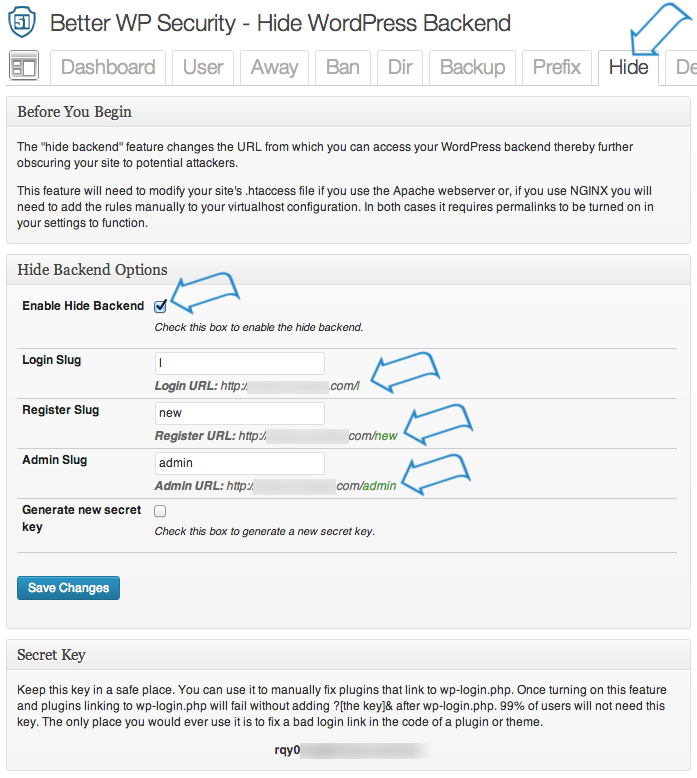 Sounds good…that we can change the login address of WordPress blogs. I will definitely change my login url, that’s the reason why im reading this post right now. i have wordfence installed on my wordpress site and keep emailing me that there was someone who tried to login using my admin username for 20 times nad then, BAM! my site is down with a database error i takes an hour before it went back really frustrating. This very complete and easy to be practiced at all, but I want to ask, if there are free tools out there that can tell us wordpress login URL? I fear that if for example there are such tools, hackers can easily certainly determines the login URL. Better WP Security completely locked me out of my site and made some HORRIBLE changes to my databases that I did not authorise. I would avoid this plugin like the plague! Sorry to hear that, M. I haven’t used BWPS recently, but I have had experiences where it didn’t do something right, I restored a backup, tried again, and then it worked. Always take backups. Hope you don’t have any long-term damage. Need backups for the future? 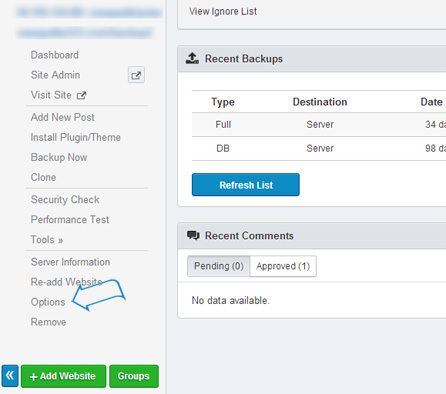 Consider https://managewp.com/user-guide/how-to-use-managewp/backup ManageWP’s backup solution. Similar results here. It was a disaster. Can’t we just add RewriteRule ^login$ http://www.mywebsite.com/wp-login.php [NC,L] to our htaccess file to do this ? The goal is not to redirect wp-login.php. Instead, we want wp-login.php to not work. Yesterday I enabled my WP site for anyone to register as a subscriber but what I saw there was more than 100 fake accounts created by the bots and that’s why I was searching and found your post to help myself . Definitely NOT awesome. Installed and setup without a problem but hours later when I went to log in to my admin panel I’m redirected to a 404 page not not found. Great. Now I can’t get in my site and have no clue how to fix what this crap broke. Hi Gene. Sorry that you’ve experienced troubles. Assuming your hosting isn’t a conflicting factor here, just SFTP into your site and edit your main .htaccess file. You can delete the lines added by BWP and you should be able to use /wp-login.php again. Once in wp-admin, you can disable the BWP plugin and try another (see previous comments) or just try to setup BWP again. Hope you get it figured out soon. First and foremost, I apologize for having used horrible manners and not asking for help properly. No excuse for that. I did go in to the .htaccess and it was simple enough to fix, have gained full access once again, thank you. Now I wonder, can I completely uninstall the plugin or do I need to restore the backup made just prior to executing Better WP Security? Once you un-do all the BWP settings, you can simply deactivate the plugin instead of needing to revert to a previous restore point. Its actual problem to change defaul wp-login. If plugin will do something wrong – i just may clean up htaccess manually. I don’t exactly understand your point, but I agree it’s bad to change WP core files, if that’s what you’re pointing out (which this plugin does not do). I got the plugin working, but when I go the site.nl/login it just redirects me to .nl/wp-login.php. Hi Marco. I’m not sure without seeing your setup, but I’d follow the steps closely just to double-check if you missed something. I’m confused as to why the developers of WordPress don’t implement a system to eliminate more of the threats they’ve been plagued with for a few years now. White Label Branding plugin on Codecanyon also allows you to make this change. There’s since been a few others that have come along as well. Hide my wordpress is pretty sensitive though because if you do the wrong thing, or another plugin blocks it’s full functionality due to a conflict from their code, you can be locked out of your site. Sorry Oleh 🙁 I don’t see the comments in the spam folder so it must have already been deleted. wow that really impressive, now i can change my WP site login url. Thanks for sharing this Clifford! I want to know, is there any other plugin available which can help me to change the login URL? As Better WP Security plugin was not working on my site when I was first time tried it. So, any idea? Hi Akash. I’ve never had a problem with Better WP Security on my hosting setups, but I’ve seen quite a few people mention this. The only issue I’ve had with BWP is on multisite when trying to create a new site with BWP active (didn’t work). Your question has good timing because Stealth Login Page just released an update with full multisite support, which makes it my new #1 if it works as I hope it will… I’m planning to try it out soon. There’s another plugin to consider from CodeCanyon called Hide My WP (see other comment for the link). Let me know if Stealth Login Page works for you and if its on single or multi. Let me know if Stealth Login Page works for you. After installing Better WP Security everything works well except now my green box doesn’t pop up when a client uses my contact form 7. The green box used to confirm that the email was sent successfully. Any thoughts on this? I am receiving the emails. I don’t use CF7 personally so I haven’t experienced this (and I don’t know what green box pop up you’re referring to — the submission text? ), but a quick Google search indicated to me several reports of the reCAPTCHA possibly having an issue with both of these installed. Have you tried CF7 + BWP active without reCAPTCHA on CF7? Actually I had to leave this amazing plugin because it shows ‘internal server error’ after some hours of installation,I checked with some of the experts like you,they told me that the plugin is not updated which is creating the issue. If you can help me on this,I will give another try to this plugin. Sorry it didn’t work for your server setup. There are several “LAMP Checker” plugins out there and maybe double-check some permissions. Maybe your server setup doesn’t have some common PHP extensions enabled; I don’t know. But you can see the WordPress Support history and know that the BWP team has a lot of users and support threads. Keeping in mind it’s a free plugin, I think less than 100% support is understandable. However, they did recently start offering premium installation and support if that interests you. I haven’t downloaded it, but I’ve heard good things about this CodeCanyon product that has a similar feature and additional features: Hide My WP. I did this but it just redirects. Is there another step involved or is this method already outdated? Installing WordPress from scratch actually allows you to set the username of the first Admin user. It has for several versions. Changing mywebsite.com with your own domain name. Hi Wil. Directly editing the .htaccess file is possible, but not everyone’s comfortable doing that. Plus, the Better WP Security plugin does a lot of other good stuff. Additionally, the goal is to get the login to “move” not just be “redirected to” because that doesn’t hide wp-login.php from being directly accessed. For those that wish to use it, though, thanks for the sharing. Excellent post I’ll save this for my wordpress security round up post. I think there are a few holes that you mentioned that most webmasters have. However, the best security is a good recent backup. Great to hear, Darnell. There’s a lot more to the Better WP Security plugin.